Assume Backstreet Oil Corp. offers a $100,000 par value bond with a contract interest rate of 15% with interest payable annually and a 4 year bond life. The market rate for this type of bond as of that date is 13% meaning the bond is selling at a premium because the contract rate (15%) offered is greater than the market rate (13%). 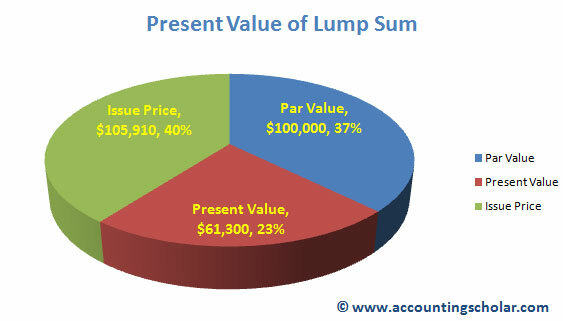 This means buyers of this bond will bid up the market price until the yield will equal the market rate. We will use the market rate of Backstreet’s bonds to calculate the present value of the bonds by using its future cash flows (coupon interest payments). In the example from the bond discounts, the term was semi-annually (2 times a year when coupon interest payments are made). However in this example, interest is paid every annually (every 12 months) so we have to factor this in to account when finding the present value from the present value table. 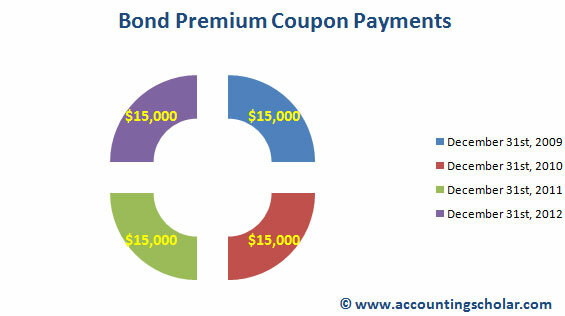 This graph (above) shows the breakdown of the total cost of bonds payable (excluding interest payments) including the discounted present value of the bonds ($61,300), the par value of the bond ($100,000) and the premium price of the bond ($105,910 - $100,000 = $5,910). Entry to record sale of $100,000 bonds at premium of 2% greater Contract rate. This obligates Backstreet Oil Corp. to pay out $15,000 annually in interest payments, as well as pay back the original amount of $100,000 upon maturity of the bonds (which will happen on January 1st, 2013). The below graph shows the expected bond premium coupon payments and the dates when Backstreet Corp. will have to pay them out. This graph above shows the annual bond interest (coupon) payments of $15,000 that are to be made to bondholders. The bond payments will be made starting December 31st, 2009 to December 31st, 2012 totalling 4 payments of $15,000 each equaling $60,000 over the life of the bonds. Backstreet Corp. receives $105,910 for its bonds and will have to repay bondholders $100,000 after 4 years, and total interest payments of $15,000 a year x 4 years = $60,000. Because the $5,910 is not repaid to bondholders, it reduces the expense of using $105,910 for 4 years. The schedule below helps us calculated total bond interest expense.